Because God forbid I just follow the rules, right? The thing with this stew is that it was just so.close. to being Whole30, but I reallyreally needed red wine in it. I was going to also use Worcestershire and flour to thicken it, but decided ONE THING is fine and the other two we can definitely live without. Because I’m not doing Whole30 and Jay didn’t actually know any of the rules before he started it. I do think that braised beef is so great with the tang of wine or beer (and the acid helps tenderize the meat), but if you don’t use alcohol or are doing Whole30 just leave it out and you’ll still love this dish. With that out of the way….here’s your plan for the next snow day, sick day, chilly day, comfort-needing day. This stew works with all of those situations and then some, why don’t we have more beef stew on Christmas Eve? I adore it; the simplicity of the flavors with the “well, yeah, I simmered it for awhile” satisfaction that makes it feel slightly fancy but totally unpretentious. 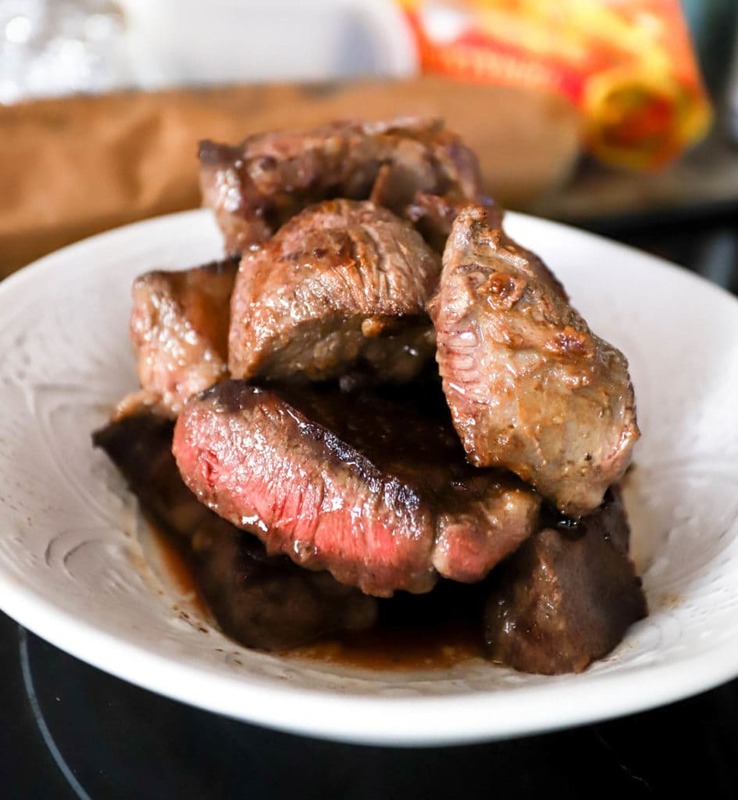 The method is simple: sear a bunch of beef chunks until really crispy on the outside. Toss some veggies in those drippings, then everything goes back into the pot together with tomato paste, garlic, spices, and wine. Broth makes it soupy, then it simmers covered for a bit, then uncovered to finish the dish and thicken the sauce. The potato here breaks down a bit to thicken the sauce (so we don’t need flour), and the end result is just SO delicious. I adore super cooked veggies in dishes like this, soaked in the broth and wine mixture and just YES. Someone please make this for me asap, I think I feel a sore throat coming on (not really just want food brought to me). I like to cut my own chunks of beef for this dish; sometimes things labeled as “stew meat” aren’t all one cut of meat so they cook at different times. Chuck roast, shoulder tender, or any large cut of beef meant for roasting or stewing is perfect for this. 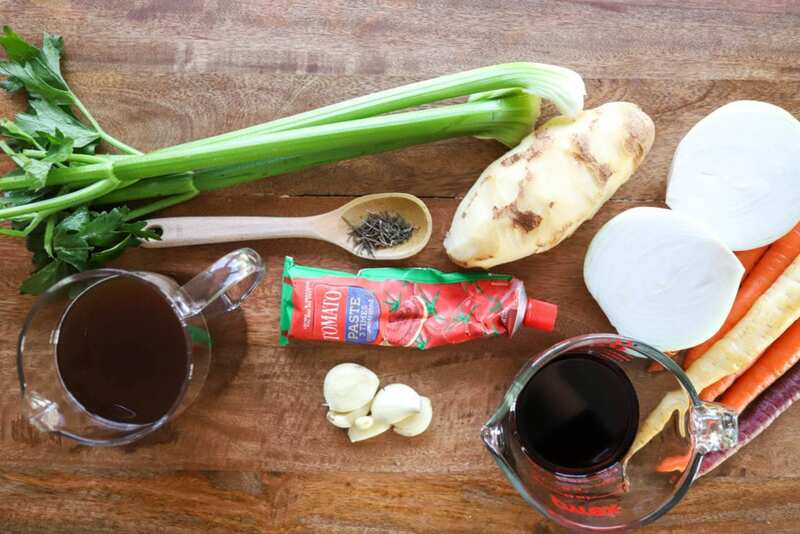 Other ingredients are a potato, celery, onion, carrots, garlic, rosemary, thyme, tomato paste, red wine, and beef broth. Definitely some salt, and bread for dunking if you’re into carbs. First, we’ll sear the meat to get it nice and crispy before we build the rest of the stew, so preheat a large pot with a lid to medium-high heat with 1/4 cup of oil – a good layer on the bottom of the pot. Cut the meat into 2-inch or so chunks, and trim as much or as little as you’d like. 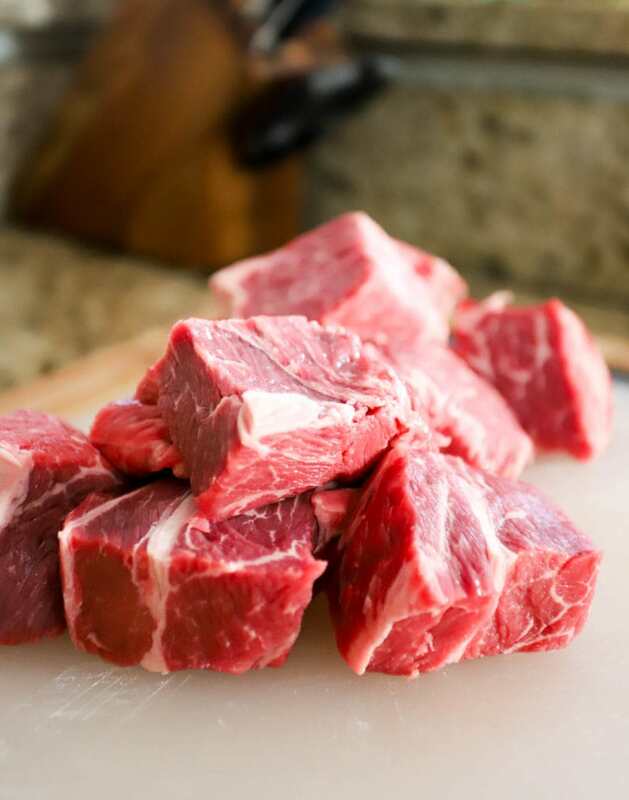 I pick beef that has some marbling throughout and cut off any large chunks of fat before I start searing the meat. When the oil is very hot, add the meat to the pot and let it sit undisturbed for about 4 minutes on each side. You’ll need to do this in batches so the pieces of meat aren’t too close together. When you flip the meat, leave it until it releases from the pan on its own; don’t tug it. When the meat has seared enough it won’t stick to the pan, so give it more time if needed. 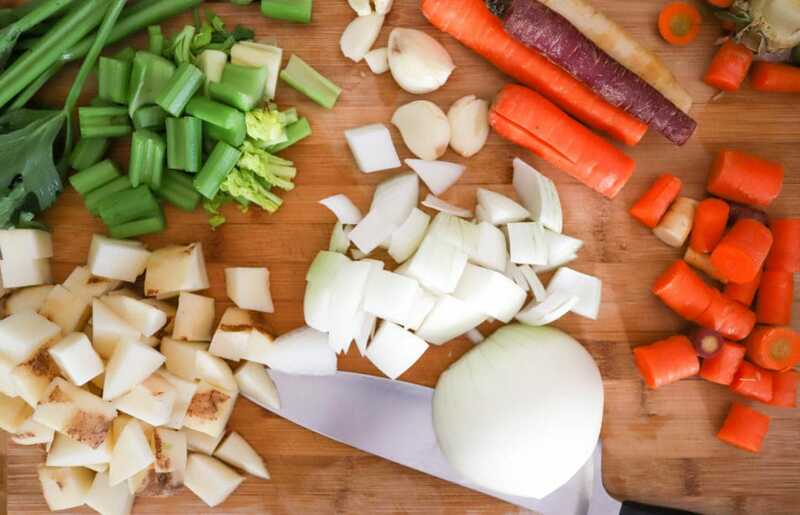 While the meat is working, chop all of the veggies. I like bite-sized pieces of veggies here, with the potato pieces slightly larger since they’ll break down a bit during the cooking process. When the meat is seared (it won’t be cooked all the way through), remove it from the pot to make room for the veggies. Add all of the veggies except for the garlic to the pot, and reduce the heat to medium. Stir the veggies for about 5 minutes, scraping up the beef drippings as you go. When the veggies have softened somewhat, add the garlic, tomato paste, rosemary, and thyme to the pot. 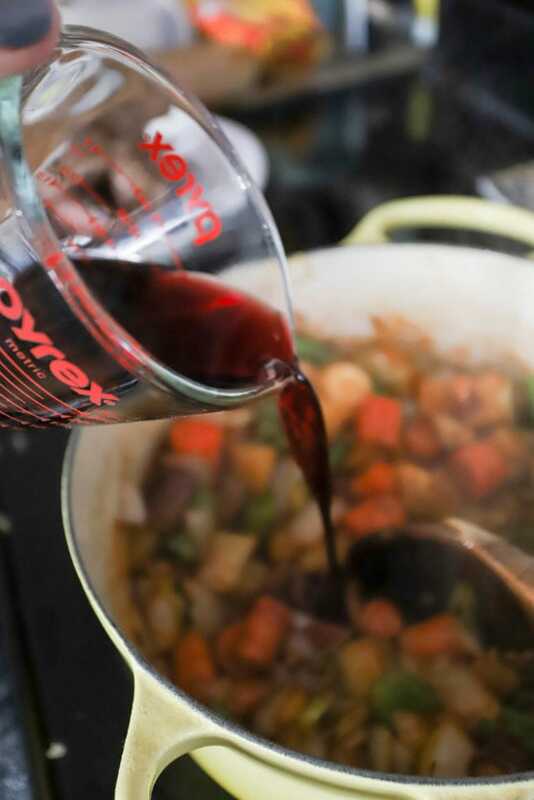 Stir the seasonings into the veggies for two minutes, then pour in the wine and beef broth. Now! Stir everything together, and sprinkle a bit of salt into the pot – a few good pinches. Add the beef back to the pot, and then we wait for the stew to cook. 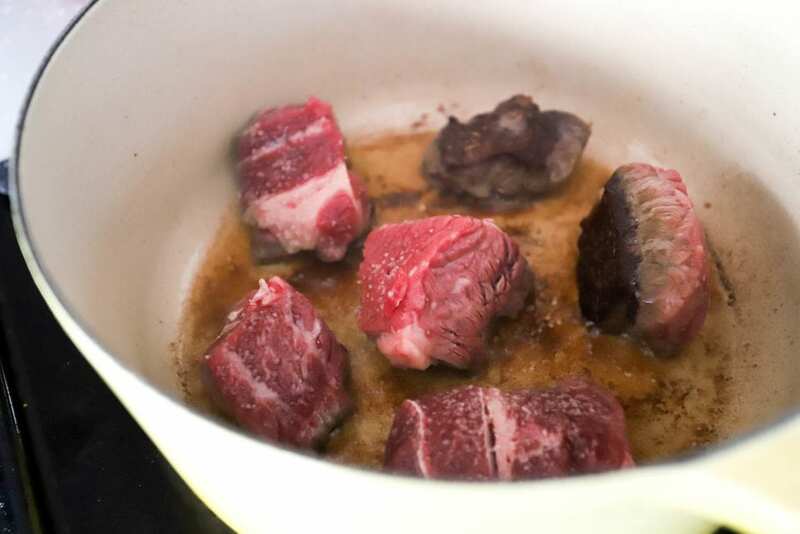 I cook this on the stovetop, but I’ve moved the entire pot to the oven before and that works well – 300F for a few hours until the beef is super tender. 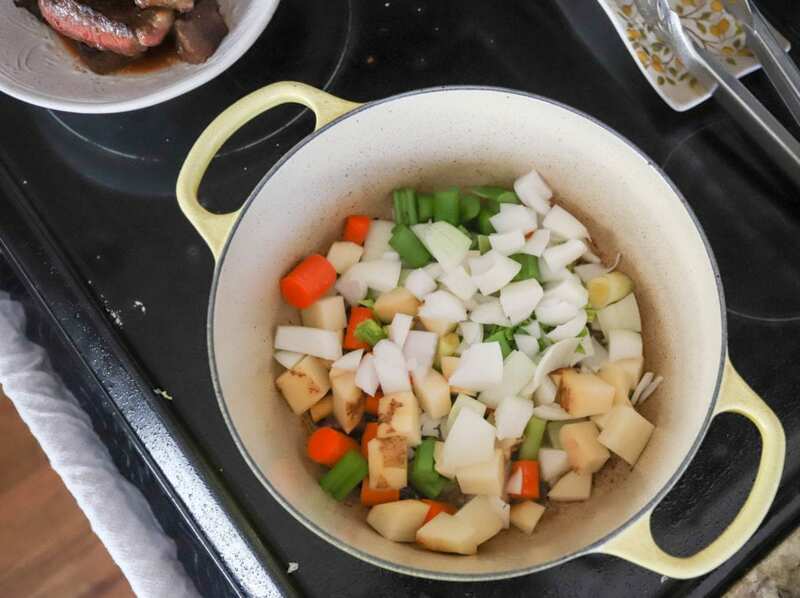 Cook time will depend on your stove, beef, and the pot you use, but BASICALLY you’ll cover the pot and reduce the heat to medium-low or low enough so that the stock is barely simmering. 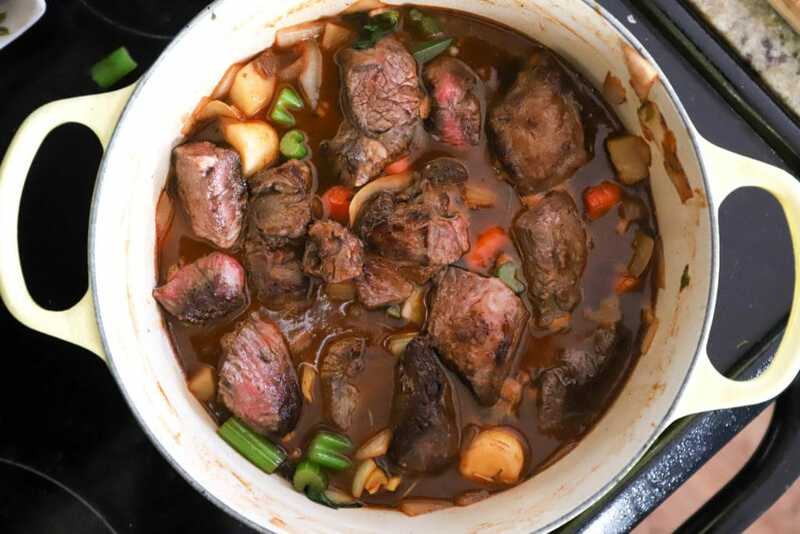 Cook the stew for 90 minutes with the lid on, then remove the lid and continue cooking for 30 minutes more or until the beef is super tender. During this process, stir the stew every 20-30 minutes. Taste the stock every once in awhile and add salt as you go to keep the liquid super flavorful. 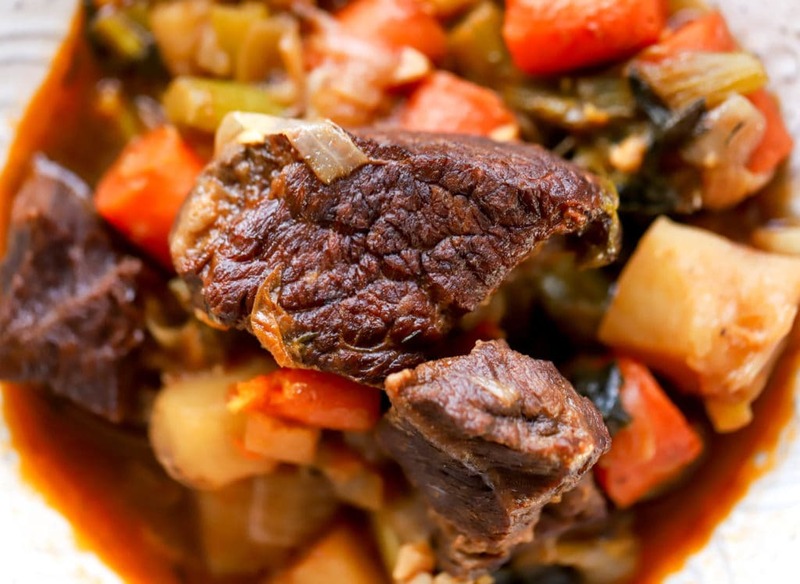 At the end of the cooking process the meat should fall apart with a fork and the stew should be thick but not dry – add splashes of stock if your stew is too thick. That’s it! I serve this with bread for anyone who wants it and that’s IT. You can add more herbs at the end if you’d like, but it’s not necessary unless you just have some on hand. GAH this is so good. 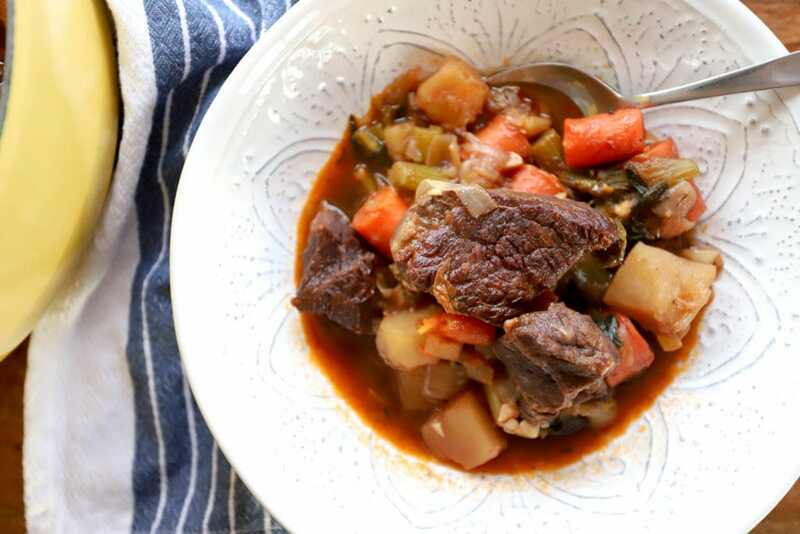 Super tender veggies and beef, the broth that is so flavorful, it’s so warm and comforting and delicious. It’s winter in a bowl, but in a good way. Enjoy! Preheat a soup pot to medium-high with 1/4 cup olive oil, or enough to make a smooth layer in the bottom of the pot. Sprinkle the beef chunks all over with salt. When the oil is very hot, add the beef in a single layer (you may need to do two batches), and let it sear undisturbed for 4-5 minutes. 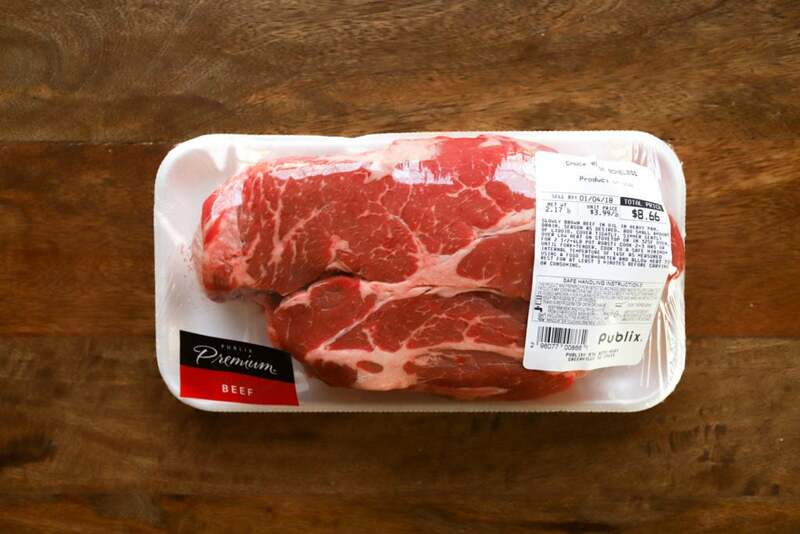 When ready to flip, the meat should release easily from the pan; if it doesn't, let it sit until it doesn't stick. Brown the meat in this way on all sides, then remove the beef to a plate to rest. Reduce the heat on the pot to medium, and add the potato, onion, celery, and carrot chunks. Cook, stirring, for about 5 minutes to soften the veggies slightly. Add the garlic, tomato paste, rosemary, and thyme to the pot. Stir the mixture together, and cook for 2 minutes more. Pour the wine and broth into the pot. Stir to combine everything, and add a few pinches of salt to the pot. Add the seared beef chunks back to the pot. Cover the stew and reduce the heat on the stovetop to medium-low. Simmer the soup covered for 90 minutes, stirring once or twice during this time. Remove the lid and simmer uncovered for 30 minutes more (or more if needed) until the stew is thick and the beef is very tender and can be cut with a fork. 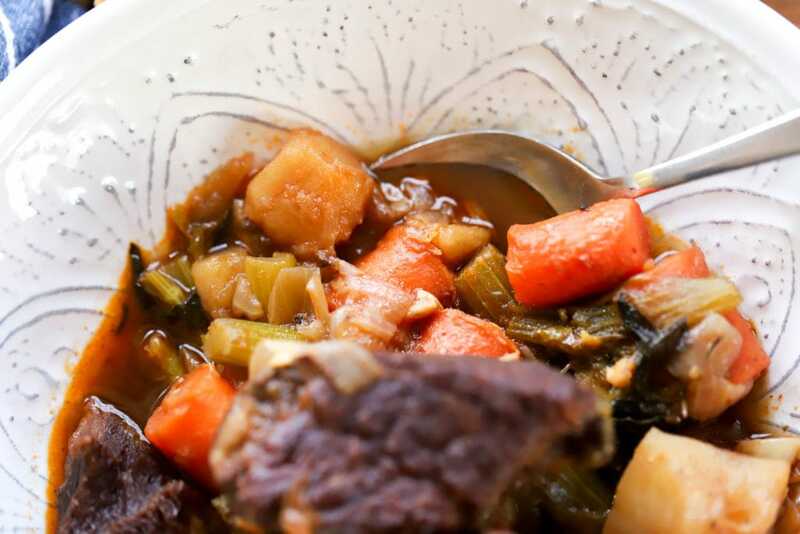 If the stew is too thick, splash in some more stock as you go to maintain an even consistency. 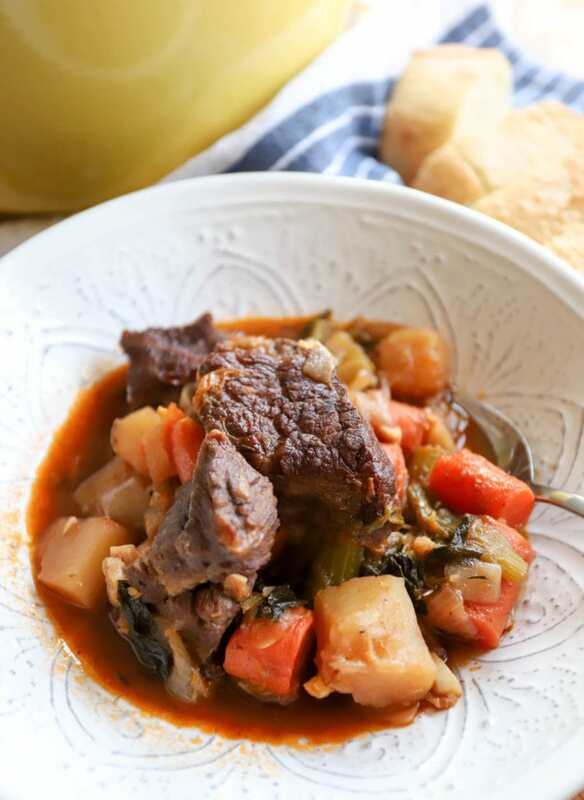 Taste the stew every once in awhile and add salt throughout the cooking process.